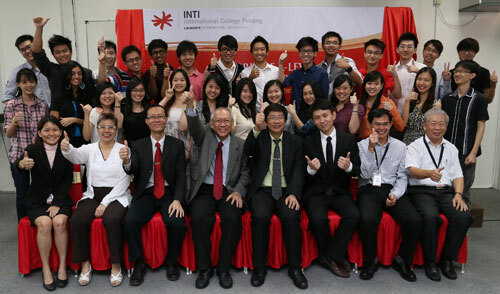 The achievement of 230 A*’s and A’s by Cambridge A level students in the May/June 2013 exams, with 23% of them obtaining straight A’s, backs a long-standing tradition of excellence enjoyed by INTI International College Penang (IICP). Vivian Khoo, Kharthik Chakravarthy, Melissa Saw, Lee Zi Thung and Esmond Chuah successfully obtained 4 A*’s each. Six other students achieved 3A*’s each and another six scored 3A*’s & 1A each. They and their fellow high achievers sang praises of their lecturers who had journeyed with them on the road to achieving an overall passing rate of 95%. “The excellent results of INTI International College Penang’s A Level students over the last three years have proven that INTI has successfully coached A Level students,” said Ng Kim Huat, Senior Schools Development Manager (Malaysia), Cambridge International Examinations. He noted that IICP students had won ‘Top in the World’ and ‘Top in Malaysia’ awards in past Cambridge Outstanding Learners Awards ceremonies, and added that it was astounding that IICP has managed to produce such good results in just over four years of conducting the A Level programme. The Cambridge A Level provides students with a wealth of options, right from having the opportunity to gain entry into many of the best universities in the world and studying a wide range of degree courses, to equipping students with reasoning ability and thinking skills as they embark on their degree programmes. For students seeking a gold standard academic qualification that is recognized globally as a gateway to world-class universities, the Cambridge A Level programme at INTI International College Penang stands out as the programme of choice. For more information on INTI’s Cambridge A levels programme, please call 04-631 0138.